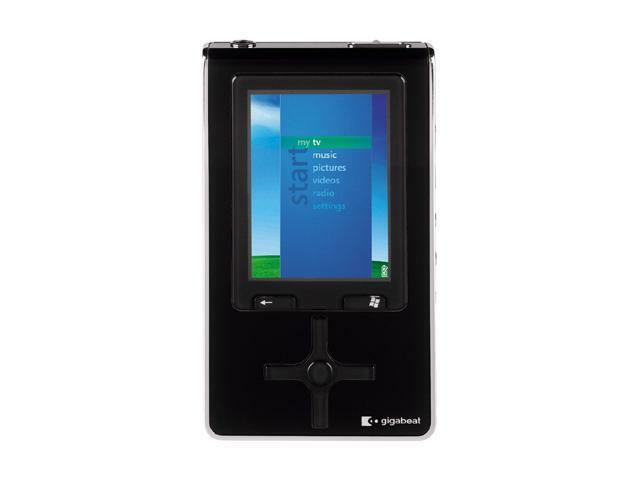 The Toshiba Gigabeat supercompact 60GB portable video player is the ultimate in multi-media portability! Tons of features, like an FM tuner and support for digital camera transfers. 2.4-inch QVGA display, which offers a resolution of 320 x 240 (65,536 colors) to ensure superb video and picture quality. You can switch to landscape mode, or output the signal to a full-size TV for group viewing. Download and view album covers on the screen, search for favorite tracks by scrolling through the album covers, or even set a favorite album as a background image. The Toshiba Gigabeat handles MP3, WMA Lossless, and WAV, as well as WMV and WMA. Other video formats, such as MPEG-4, AVI, DivX, and MOV, are automatically transcoded in Windows Media Player 11. Can be connected to, and controlled via an Xbox 360's interface. 60 GB hard drive holds about 15,000 songs (more than 1,000 complete albums) at 128 kbps, a mind-boggling 30,000 songs at 64 kbps, and a still-impressive 1,700 songs, or 114 hours, of CD-resolution WAV files. PlaysForSure-certified by Microsoft, which means that it will operate with any similarly designated management software or download service, such as Napster, Rhapsody, and Wal-Mart Music Downloads. Users can also subscribe to movies or TV shows via MTV/Microsoft's Urge, TiVo to Go, Starz Vongo, and a host of other sites. 60GB Huge Storage Capacity With a stunning 60GB storage capacity, store up to 1000 hours of music or 255 hours of Videos or tons of thousands of photo files in the TOSHIBA MES60VK! 2.4-inch TFT QVGA Color Screen The versatile TOSHIBA MES60VK features a 2.4-inch TFT QVGA color screen (320 x 240) for comfortable video and photo viewing and convenient navigation. Windows Mobile Portable Media Center Software Enjoy music, view photos and watch video and TV programming anywhere you go with Windows Mobile Portable Media Center software! Connect the TOSHIBA MES60VK player to your Xbox360 and enjoy your favorite music while playing games. Up to 12 Hours of Music or 2.5 Hours of Video Playback With a built-in rechargeable Li-ion battery, enjoy up to 12 hours of music or 2.5 hours of video playback on a full charge either via USB or AC adapter! Pros: NO DRM! !, no need to install a program to transfer music. awesome sound quality, superb build quality, very durable(ive dropped it a few times and it still works great), very easy navigation, 60GB! !, sharp screen, Love the TV out option!!!!! I have had many mp3 players and this is by far the best!! Cons: Wished it played other video files besides WMV. But just used a good file converting program and it runs smooth. Other Thoughts: This proves there are other and better MP3s players out there besides the ipod!! Pros: Quick, nice functional features, has an equalizer and FM radio receiver one-up on the most popular mp3 (i.e. m4a) player out there while still maintaining the sleek factor and functional ease of that lily-white player, has dedicated controls for volume and song skipping, nice screen, bright screen. Cons: Hard-drive started making noise and vibrating screeches about one week in (not that loud and not noticeable), can only work with Windows Media Player which means album and artist sorting is slow but easy, not as many accessories provided by third-parties (cheaper) as the pod, very inconvenient to convert videos into .wmv format to sync onto device. Other Thoughts: Great buy, bought for halfway between two and three hundred dollars, works, better features and much more compatible with most of my music library than other players, I'm happy with the thing and would choose it over other players again.